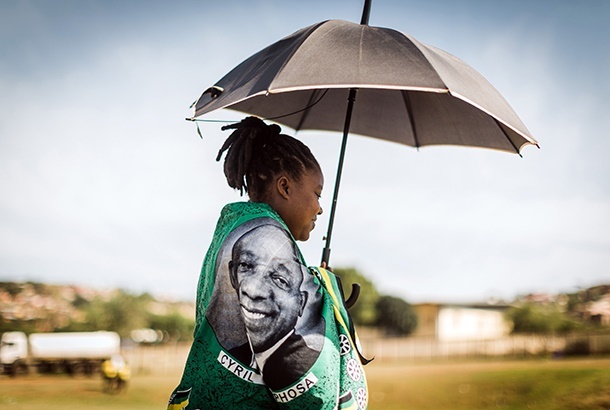 An African National Congress (ANC) supporter arrives to attend a campaign rally of South African president, and president of the ruling party, at the Manzolwandle Sports Field in rural Kwa-Ximba, on March 31, 2019. - South Africans will go to the polls for national elections on May 8, 2019. (Photo by RAJESH JANTILAL / AFP),?­sXÖ½Þ£? President Cyril Ramaphosa faces an extended battle with the rogue elements in the ANC. Mpumelelo Mkhabela says the this battle will define both the nature of the party and Ramaphosa's character as a leader. The ANC has a reputation as a "broad church" in which coexist nationalists, liberals, workers, the propertied class, the unemployed and communists. This spirit of tolerance made it a church of contradictions, best illustrated by the ideological fights within the tripartite alliance. For ideological purists, this was untenable. The unity of the diverse groupings against the common enemy of apartheid was the ANC's strength. If managed and nurtured properly, this diversity, with all its contradictions, could continue to serve as a strength for the party in government. It cannot be a weakness for all strands of society to see themselves reflected in the governing party. The ANC's rogue elements that presided over state capture have gained notoriety and attracted attention. Gangster State, the book about ANC secretary general Ace Magashule's ruinous years in the Free State government, in many ways suggests Motlanthe's observations could be worryingly true. Even more dramatic for a book of that title is the gangster manner in which a public discussion about it, that is the book launch event, was disrupted at Exclusive Books in Sandton by people claiming to be members of the ANC defending their secretary general. Other members of the party had publicly announced plans to burn copies of the book in Free State, Magashule's home province. Thankfully, sanity prevailed as the ANC intervened to stop such barbaric actions from taking place. But it's not the whole ANC that prevailed. It is the sensible component of the ANC which is waging a battle against the rogues. The rogues have so far lost three times on the Gangster State matter alone. First, they were told not use the name of the ANC to defend allegations against an individual. Secondly, their gangster conduct in Sandton was condemned. The ANC aligned itself with public sentiment of disgust against the thuggery. Lastly, they were stopped in their tracks from burning books in the Free State. In the run-up to Polokwane, ANC T-shirts bearing President Thabo Mbeki's name were burnt by people claiming to be supporters of Jacob Zuma. One suspects that, even though rogues had already infiltrated the party, they became daring for the first time when they publicly burnt the Mbeki T-shirts in KwaZulu-Natal. If you could burn paraphernalia bearing colours of your own party, surely a book by a critical journalist should be easy meat. It's obviously not the same crowd and the context is different. Those responsible, however, have one thing in common: they are rogues who support leaders based on narrow considerations, and are prepared to sacrifice what were once noble party principles to get what they want. Ramaphosa will also have to prove that he is not amenable to any form of new capture himself by people who might feel so hard done by Guptas that they are tempted think it's their time to eat. He shouldn't associate with rogues of whatever form if he wants the public to support him in this mother of all political battles.